Dowels are a solid pin that are traditionally used for accurate location and alignment relying on the tightness of fit to stay in position. These are available in a range of specifications to suit differing applications. Commonly available in steel, often hardened and ground, and stainless steel. Grooved Pins are similar to Dowels but have a sequence of grooves along the length that provide a displacement fit with the mating hole. The hole itself does not have to be as accurately machined as is the case with the Dowel. 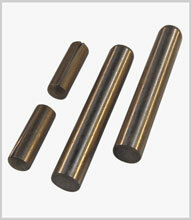 Grooved Pins are available in several specifications to suit a wide range of applications. Commonly available in steel but also in stainless steel.